We have nothing against neutral kitchens — Features like white subway tile or stainless steel appliances are classics. But to be honest, these days we are thirsty for color. Vibrant cabinetry, jewel-toned ranges, and colorful tile in every shade of the rainbow are all showstopping ways to put a bold, personal twist on a cooking space. Even better, colorizing your kitchen can be as easy as adding several cherry-picked accessories. To help you create the hue-infused space of your dreams, behold these 37 colorful kitchen ideas. Hello yellow! In this vibrant kitchen by Alys Design a fresh coat of the sunshiny shade brightens up the vintage cabinets. The color looks surprisingly modern against the natural wood walls. You do not have to stick with a dull neutral shade when deciding a monochromatic color scheme for a kitchen remodel. Here's a fiery hue of red spices up a tiny kitchen by Gleba and Stoermer. In the modern farmhouse by D2 Interieurs, several colorful accents punch up the mostly white cooking space. A couple of green light fixtures illuminate the kitchen island. Pretty upholstery takes the rustic bar stools from bland to snazzy. The frosting on the cupcake is the leaf print window shade. Cement tiles featuring a flying flock of birds add a little color and whimsy to a muted gray kitchen by Vidal Design Collaborative. There is plenty to love in this colorful, country kitchen by Alison Kandler Interior Design. For starters, stencils and paint update the old, wood floors. The red kitchen island brings cheerful contrast. Yellow patterned wallpaper beautifies the built-in cabinets. The blue Viking range and cherry red cabinet knobs both help to balance the space. We love this Mondrian inspired kitchen by Ande Bunbury Architects. The team transformed basic cabinetry by painting each door a different color. Both the pink and blue countertops are made of resilient acrylic polymer. Mixing and matching colorful tile is an unexpected way to perk up a kitchen, for example, like in the two different backsplashes in this blue kitchen by Vidal Design Collaborative. In this Australian home by Brett Mickan Interior Design, the green wall envelopes the space with color while also having a receding effect that sets the tone for the white and blue kitchen features. Spanish tile and a turquoise kitchen island both serve up heaping doses of color in this cooking space by James David Custom Homes. Patterned wallpaper and a collection of curious objects colorize this eclectic kitchen in a studio apartment by Katie Rosenfeld Interior Design. To enliven this neutral cooking space, interior designer Katie Rosenfeld employed various shades of green, blue and orange. Pretty patterned fabrics spice up the breakfast nook. Three orange drum shades and three blue bar stools sweeten the kitchen island. This new cooking space by interior designer Alison Kandler packs an irresistible retro vibe. The yellow screen door was picked up at a local flea market and later refinished. Green cabinetry adds to the old-timey kitchen feeling. Bright color and touchable texture define this chic cooking space by Nerland Building and Restoration. The acid yellow wall anchors the area. The three-dimensional tile backsplash is an unexpected modern twist with a significant wow factor. A Kelly green kitchen island adds brilliant color to this neutral cooking space by Copper Sky Renovations. Two more beautiful features worth mentioning are the gilded iron Morris Lanterns by McGee and Company that lend sparkle. Dynamic colors and peppy patterns are a winning combination in this tropically inspired cooking space by Copper Sky Renovations. Solid surface countertops in turquoise add colorful swagger. The beautiful blue walls are topped off with a vibrant orange ceiling runner. The chevron fabric on the chairs tacks on extra pizazz. A multihued glass, mosaic backsplash stands out against the white cabinets. Here a predominantly, white cooking space by Terracotta Design Build Company proves that primary colors are anything but juvenile. The blue kitchen island and red bar stools are sophisticated pieces that pop against the white cabinetry. Accessories abounding in color can instantly boost the mood in any room at home. Here, colorful Fiestaware, which is a line of multihued ceramic dinnerware, infuses a kitchen by Alison Kandler Interior Design with spirited zing. Who says a minimalist kitchen has to feel cold and stark? This tiny cooking space by Brian O'Tuama Architecture features flat, front cabinets in various shades of blue. Punctuating things is a lime green radiator. Cozy colors make this farmhouse kitchen designed by Traditional Bespoke Furniture incredibly lovable. Anchoring the space is a cherry red island with three vibrant bars stools. Art on the walls and decorative dishware pour on the colorful charm. A beach house in Cape May, New Jersey gets a spanking new retro renovation by Knight Architects. Turquoise appliances perk up the kitchen with cheerful color. The red swinging doors and Coca-Cola bar stools are both happy finds. Providing practical task lighting over the sink are three Astron Aluminum Pendants by Rejuvenation. Our favorite update is the concrete countertop. It is an inexpensive feature with staying power. Designer white walls and beautiful blue cabinetry are the essential ingredients in this charming cottage kitchen by Meriwether Inc Architecture & Design. An apron sink sprinkles on farmhouse style. A classic, subway tile backsplash brings enduring style. Cabinets panels over the refrigerator help the appliance to blend in instead of sticking out. The interior design team behind Studio Stamp say adding brightness was vital when creating this cooking space. Several elements got the job done. Most notable is the splashy tile backsplash. Another interesting statement is the vertical rack brimming with colorful cookbooks. Express your unique style with a one of a kind backsplash. When the owners of this home wanted to reveal their true inner colors, they turned to Mercury Mosaics. Here handmade subway tile in six different, yummy shades creates a spectacular focal point. A yellow kitchen island anchors this cheerful kitchen by Alison Kandler Interior Designer. Upper cabinets lined with hot pink wallpaper break up white space. Green and blue furniture, and peppy pillows make for an extra buoyant breakfast nook. Amity Worrel and Company designed this 1880s inspired kitchen for a period house. The labor of love captures the historical details noted throughout the home. All the cabinetry are a historic shade of teal. Brass screens on the cabinet doors are in step with the old-world look. A neutral kitchen is a blank canvas for a backsplash exploding with vibrant colors. The design firm, 50 Degrees North Architects used paint to create the eye-catching installation. A glass sheet keeps the backsplash protected. The red bar stools unify space. Orange took the helm of this kitchen renovation by Kristy Kropat Interior Design. A solid surface countertop and undermount sink both inject the space with delicious citrus. Over the kitchen table is the FL/Y pendant lamp by Kartell. Its acrylic shade filters light with a tinge orange. When updating her kitchen, interior designer Tammy Bronfen incorporated swathes of turquoise, her absolute favorite shade. The custom-made cabinetry pairs beautifully with the gray, crackle backsplash. While her kitchen table looks small, it can extend to sit up to 10 people. A custom black and gray kitchen by Parker Bathrooms get a colorful lift from glossy upper cabinets. Avocado Sweets Design Studio gave a dingy and dark kitchen a new vibrant life. The showstopping feature in this rustic cooking spaces is the French range by Lacanche in deft blue. A green cabinet and a mix of small kitchen accessories add pleasing doses of enlivening color. Chango and Company dialed up the color in this white kitchen by adding yellow bar stools and pineapple pattern wallpaper. Several zesty accents invigorate this cooking space by The Jack and Mare Design and Build. A bold blue kitchen island with yellow bar stools brings balance. Colorful accents including the yellow light fixture and teal kitchen clock add several splashes of visual interest. Two chairs introduce dashes of green color to this cobalt kitchen by Square Footage Inc. Rustic wood shelving adds a touch of warmth. Warm up cool toned kitchen accents with a fresh and warm wall color. Here the interior designers at Nimú paired an orangy shade of salmon with navy blue. A stone sink can add texture and color to a cooking space. In this rustic farmhouse kitchen by JAS Design Build, a soapstone example pairs beautifully with a yellow kitchen island. 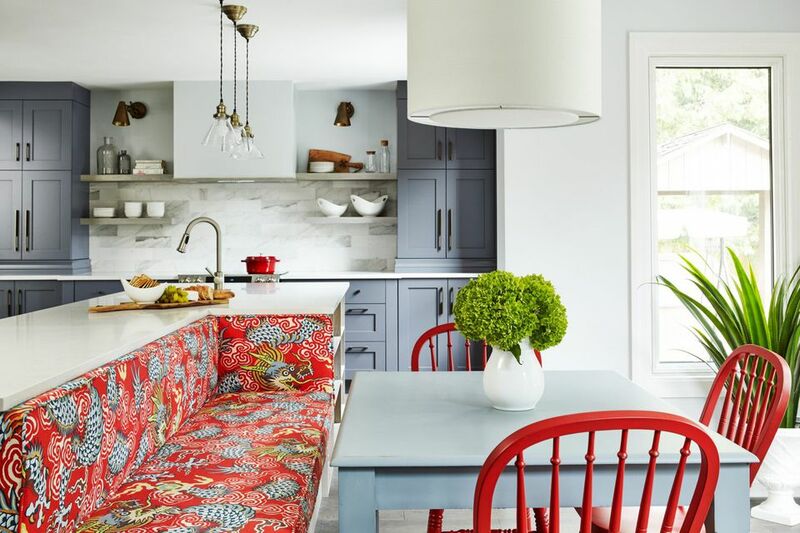 A high impact fabric featuring a red dragon print satisfies a client's need for color in this eclectic cooking space by Square Footage Inc. We love how the material puts the focus on the breakfast nook.